« (2) two speed homopolar motor ! I have been thinking about brushless motors for a while now, and I wanted to replace a small brush motor with a brushless one but wasn’t sure how to go about it. I looked up how they work to refresh my memory, then I thought I might make one out of permanent magnets and a few coils, but how was I going to control the switching of the coils? If I did use some kind of IC chip to do the logic it would add cost. Then I thought maybe I can just use some kind of analog circuit. 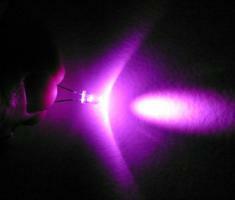 Like maybe an infrared sensor tied to a transistor to time the pulses, or maybe a hall effect sensor. So Looked up “simple brushless motor” and found this site. 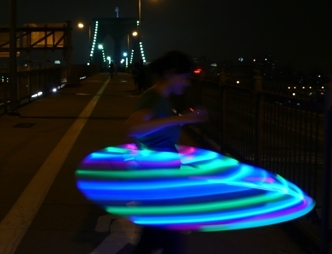 It shows you how to make your own with all those sensors including a reed switch, pros cons etc. 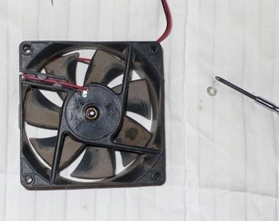 I started to feel like making my own would be a pain and not efficient anyway, so I tried to think of a brushless motor I could find around the house and remembered that PC fans are brushless. I was pretty sure the PC only gave a voltage to the fan and did not offer any pulsing, so the motor must have some logic circuit built in. Perfect. I looked for photos online of PC fans opened up but a quick searched turned up nothing. I don’t know if a PC fan has enough power for what I’d like it to do. But I knew I was ready to take one apart. 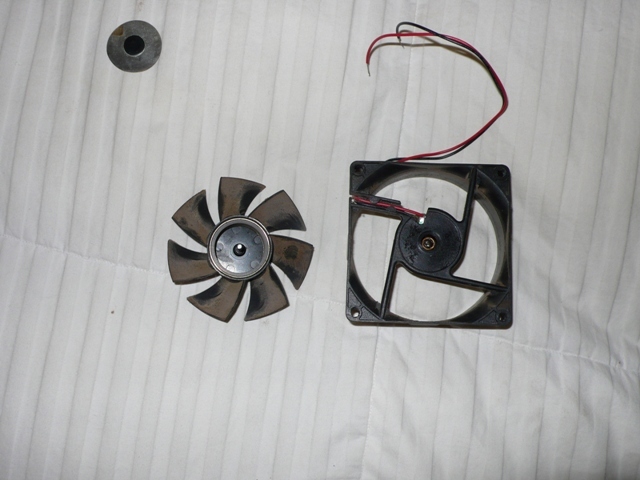 So I found an old PC fan that I am pretty sure didn’t work and went at it. First I put the dusty dirty old fan on my nice white down comforter [smart], and took pictures and video. Here we go. Its called “PowMax” – well its dead now, so not so much Pow and not so much Max. If you want to power it you need to offer 12Vdc. 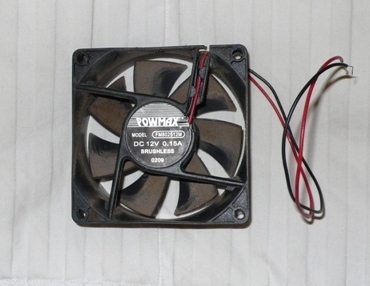 I am not even sure its speed would change if you gave it a less, since it’s a cheapo fan and it only has 2 leads. Black and Red. Which means its only for power and there is no third wire which can be tied to a sensor. This sensor usually gives feedback to the PC to make sure it actually running. So if you pull up this nifty lil sticker on the back it also automagically picks up this little plastic disc that covers the shaft area. So what you can see so far is a metal shaft and what looks like a plain plastic washer on its end. At first I wasn’t sure what this was and to remove the fan from its housing I started to pull and prod it, but it didn’t budge. So before I break the housing I figured I would check that plastic disc again. I poked it with a screwdriver and pryed it off the shaft. Turns out its just a simple thin washer like disc split radially on one side. Kind of a very crude, simple, retainer ring. I should have known.. but hey I am really tired gimme a break. You can see it in this blurry picture below.. right? Or try the next one as it sits next to the fan making a nice greasy spot on my comforter, stupid. And yes there is some grease in here, and as after pulling off the retainer you can see the bearing is an good old oilite brass bushing bearing. There are commonly used in motors and are the cheapest way to go. 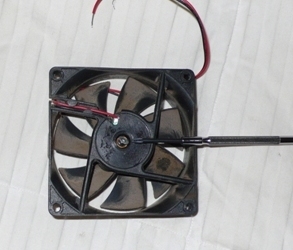 It’s a very good sign that this was a stock cheap-o fan. Now a tug at the fan and it comes off, but with some resistance. Its interesting because when it was all assembled the fan moved axially and bounced back when pushed like its on a spring. But there is no spring that resistance from axial movement is provided by the permanent magnets reacting to the wound coils. 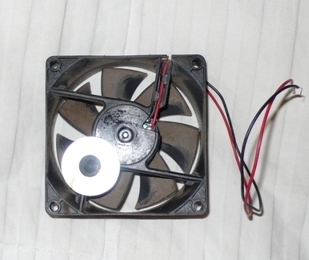 The magnet in the fan actually keeps the fan in place, even without the retainer disc. Something to think about using in your own projects. You just wanna make sure your fan won’t lift itself right off the shaft when it reaches speed.. or maybe you do want it too.. Hmmm. Toy helicopter anyone? So back to the dissection. Here is a view of the back of the frame and the back of the fan. At this point focus on the ring that is in the fan hub. This is a cylinder permanent magnet. That is what reacts to the changing magnetic field produced by the coils. Now lets flip over the case and show you the coils. In a brushless motor there are two main parts, a rotor and a stator. Just like a brush motor the rotor spins and the stator stays put. But unlike a brush motor, the rotor contains permanent magnets and the stator has electromagnetic coils that turn on and off. Another important thing to note is that more brushless motor descriptions you find on the net will shoe the rotor and permanent magnets on the shaft and the stator in the shape of a ring surrounding the rotating shaft. Here it’s a bit different. The shaft is spinning inside the electromagnets, but the permanent magnet is actually on the outside of the stator. As for the magnet inside the fan hub, it seems to be made of similar material to what you would find on refrigerator magnets. Except this rind is magnetized in only 4 places equal distant to eachother. Its either that or the poles are alternating. You can test it yourself and let me know what you think. But I have a video here showing how my screwdriver skips to 4 places. So I think there are only 4 magnetized sections. Anyway, now for some close ups of the stator. The contruction is pretty neat. There are 4 plastic posts that support the 4 electromagnets. The plastic is probably pressed on from the top and the bottom to complete the package before the wire is wound. Also notice there is one transistor looking device on the board, but it has 4 leads, so I gotta see what it is. I will look up the code W41FB 7230. 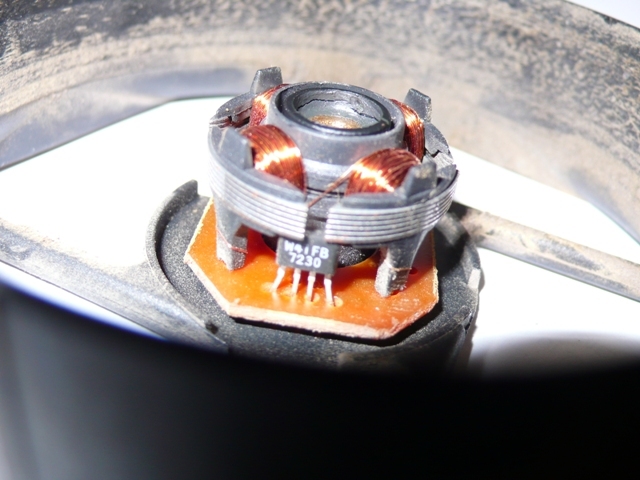 The rotor is mounted to a PCB of sorts, but I am not sure there is any other circuitry on it. I haven’t been able to easily remove the stator from the housing. And I am not ready to break it, yet. Take a look at this next pic. The bearing looks like its press fit into the housing. The housing is the darker colored plastic. Maybe I can just push it out. At first I thought the stator was press fit onto the bearing or the housing. But a closer look shows some space between the stator plastic frame and fan housing. Hmm dunno. But if I pull hard enough I might break the housing. On top of the bearing you can see gobs of grease doing absolutely nothing out there. 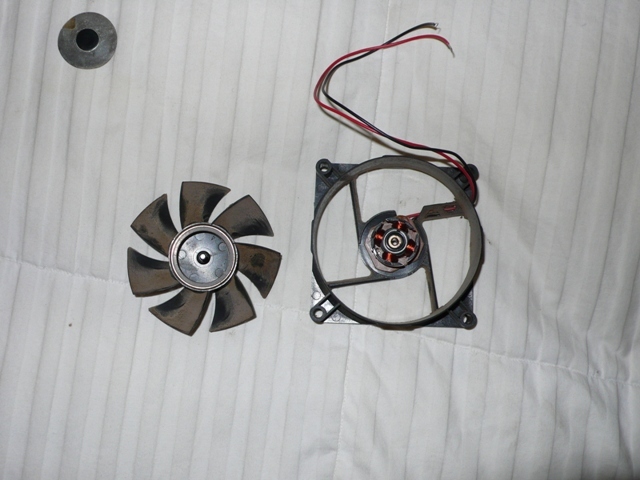 So what follows are two videos, one shows the fan staying on the stator without the retainer ring in place. And the other shows me searching for the magnetized sections of the magnet in the fan hub and discovering only 4. Well since I didn’t remove the stator from the hub I am not sure you can just take the parts off and use them in your projects easily, but you could definitely replace the fan with a rotor of your choice. 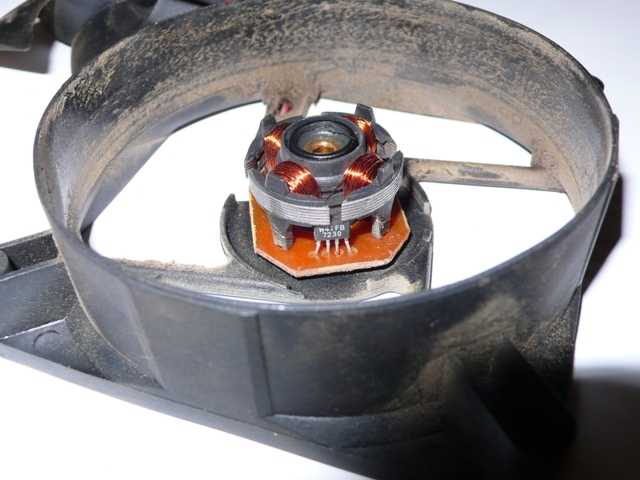 You would have to remove the magnet from the fan and install it into your new rotor. Or just clip off the fins and glue a new object to the fan hub. Give it 12Vdc and make sure its really dead. If its alive give it 24 Vdc and see if it goes faster or blows the circuit. If its really dead – take everything apart. 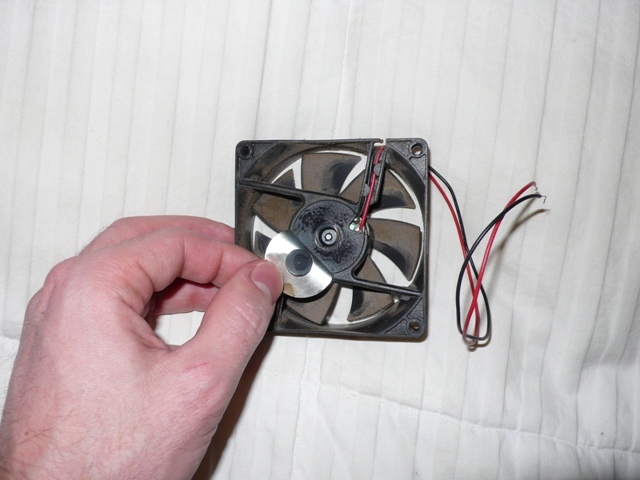 Start with the fan magnet since you can use it later. Then try pulling the stator board off the casing. Then cut away the plastic stator frame to expose the laminates. Does anyone know what that chip is? Anyone know what if the laminates probably look like? Anyone try giving less or more than 12Vdc to obtain speed control? You can actually take it out by pulling the whole circuit while rotating or twisting.That transistor is hall sensor.